Hello, my name is Eunsu Kim, director and founder of Sorichung Enterprise. 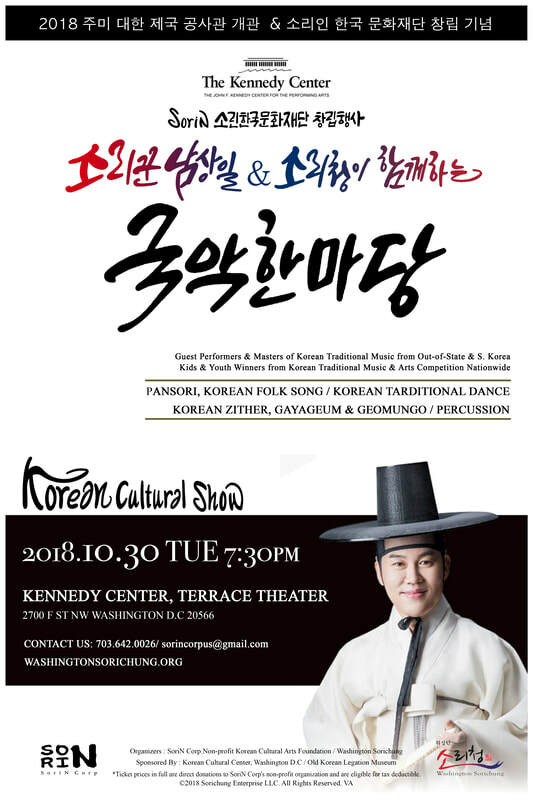 Washington Sorichung will be inviting Korean traditional artists to join them in the 1st annual Korean Culture Show marking the debut of SoriN Corp. We plan to create an exciting performance held at the Terrace theater at The John F. Kennedy Performing Arts Center this October of 2018, as well as dedicate a celebration of the reopening of the Old Korean Legation Museum. Marking their debut, the 501(c) non-profit SoriN Corp, in partnership with Sorichung Enterprise, host their 1st Annual Korean Culture Show showcasing the traditional sounds and dances of Korea at the John F. Kennedy Center. With extraordinary storytelling through pansori (Korean folksong), instruments, and dance, Washington Sorichung Korean Traditional Music Institute along with professional guest performers coming all the way from South Korea create a vibrant one of a kind performance. ​*Ticket prices in full are direct donations to SoriN Corp's non-profit organization and are eligible for tax deductible. Call us at 703.642.0026 or email us at sorincorpus@gmail.com / washingtonsorichung@gmail.com for further questions or inquiries! Tickets Sales in full are direct donations to SoriN Corp's non-profit organization and are eligible for TAX DEDUCTIBLE. Our performers have generously gifted their talents to this event. All donations are eligible for TAX DEDUCTIBLE. As a truly collaborative event, the 1st Annual Korean Culture Show is financed with sponsorships from the community, donations, and ticket sales from performance. Businesses, in return, receive unlimited exposure to hundreds of residents throughout the Northern Virginia area and local Korean American community. Please join this mutually beneficial effort by becoming a sponsor today! is a renown young soriggun in Korea for his wit and creative talent. He graduated from Korea National University of Arts and performed at numerous Changgeuks (traditional Korean opera). 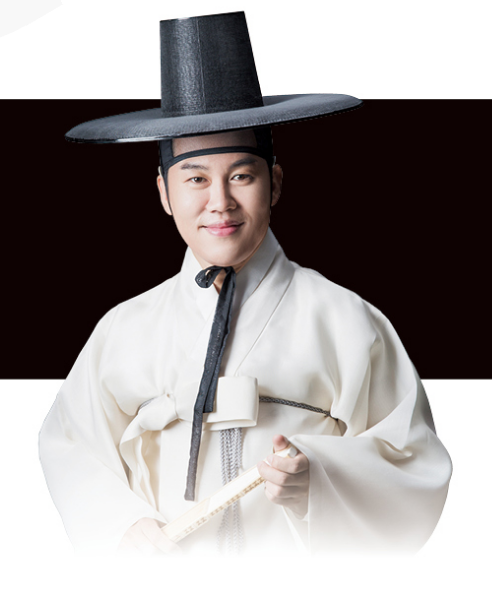 He is dedicated in cultivating interest in Korean traditional music through various TV programs. is a Korean traditional music artist of Gayageum-Byeongchang and Pansori. She is recognized under the Korean Government’s Ministry Of Culture as a “holder” (yi-su-ja) of Intangible Cultural Property No. 23: Gayageum-Sanjo and Gayageum-Byeongchang (solo zither performance with song), having studied with Sooksun An, a living national treasure of Pansori and Gayageum. Ms. Oh received her master’s degree in music from Chung-Ang University in Seoul. She is currently a music director and teaching artist at the Woori Garak Korean Culture Arts Center based in New Jersey, and teaches in Greater New England area. graduated from Korea National University of Arts and appears in various TV programs to bring awareness to Korean traditional music. is the founder and director of Sorichung Enterprise LLC (2007) and the current president of SoriN Corp Korean Cultural Performing Arts Foundation (2018). She also runs the Washington Sorichung Korean Traditional Music Institute and operates Soricha Tea & Theater, holding monthly Korean traditional performances in Virginia with local, out-of-state, and international artists. She is widely sought after nationwide and on a global scale by colleges and universities, notable events, associations, etc. to perform and hold workshops.